From Corkscrew Stakes to Sky Guys! 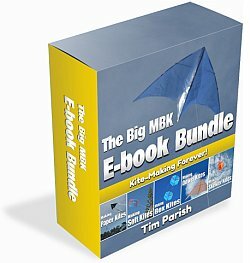 I'll stick to single-line kites for now, like the ones on the cover of my Big MBK E-book Bundle. Once upon a time it was simple, wasn't it. Buy a kite, the reel and flying line came with it. End of story. Anything else was up to your own imagination and creativity. Was the line too short? Well, get some fishing line off that fishing rod over there and try again. Anchoring the kite? Well, just loop the line around a post, or drag that big stone a bit closer and trap the winder behind it. Hey, I've actually done both these things myself not too long ago! But now... Where there are people, the merchants follow. With kite flying as popular as ever, and a larger population than ever before on this planet, there is definitely a market for bits and pieces of stuff associated with kite flying. A kite accessory for everyone's small needs and wants. Even some of the names were rather intriguing, like the ermm Sky Guys already mentioned. Winders and reels. You do know the difference between them don't you? Winders are flat, with the line going around the two ends and lying flat in between. Many of these have a hand grip for extra convenience. The mass produced ones are plastic while there are a few nice hand-made polished wooden ones for sale too. Spools on the other hand are simple round hubs with sides to keep the line in place. The most common ones now seem to be made of shiny hard plastic. One online shop called a spool a 'winder'. Tsk tsk tsk, tut tut tut! Wind measurement. To keep things simple, you can just stick up a small windsock to get some idea of the wind strength and direction. Flags can also be used for the same purpose. With practice, either of these can give quite good estimates of average wind strength and direction. For example, whether or not the bottom edge of the flag stays straight out, together with how fast it ripples can tell you an approximate wind range. Windsocks would be a little tricky to make at home, but a simple flag would be easy. The other more precise approach is to buy a portable wind meter. This nifty little electronic kite accessory will give an accurate indication of wind speed, and a thousand other things too that you probably don't need. Knowing wind speed is particularly handy for home-made kites that might not have the huge wind range of shop-bought kites which use space-age materials. On the other hand, why not just take out 3 kites that cover all wind ranges between them. I sometimes do exactly that with my MBK kites! Flying Line. Ho hum, yes, there's plenty of line available. Mainly in Nylon and Dacron for single-line kites. The usual range for these kite lines is from 20 pounds right up to 250 pounds plus. Why on earth is it always in pounds and not kilos? My guess is that the very well established U.S. kiting market has something to do with it... Having said that, I did notice that Kilograms are often used for kite surfing and sport kite gear. That isn't so surprising considering how popular those activities are in Europe. Good old-fashioned cotton line is still available here and there, sold on simple winders ready-to-fly. These would be quite handy for home-made kids' kites. Anchor points. There are definitely some handy kite accessories here. In particular, what do you do down at the beach when your kite is happily up there at 300 feet and your kid needs a nappy change or something? Or perhaps you would rather watch your kite from the shade, so the Ozone Hole doesn't nuke your bald patch... Down here in South Australia, we're not that far from the dreaded Hole. So, you can buy some simple plastic tent pegs, one of which could be used to tether your kite. The older metal ones would be fine too, they just weigh a bit more to carry around. In fact steel ground stakes are available from kite shops too. Perhaps this kite accessory would be better for really big kites. Thick hollow ground stakes are also available, which I guess hold a bit better without being too heavy to carry around. Finally, another kite accessory is the corkscrew ground stake which is designed to grip the ground better than a simple peg. All these can be used on normal ground or at the beach. You could be in trouble if the ground is extremely dry though, as is often the case in South Australia! A hefty hammer and a sharp steel peg would do the trick when the ground is like concrete. Tails. It's not hard to whip together something colorful that works, for example by cutting up some orange and some green garbage bags. However, for a touch of class there's some really eye-catching artistic stuff that can be bought. Also, some of the shop-bought tails are designed to be quite efficient at producing the needed drag without being excessively long or heavy. Line laundry. This type of kite accessory is anything you might decide to attach to the flying line of a kite, for extra spectacle. Flags, banners, tubes, spinners, inflatable shapes and characters and so on. If you have ever been to a kite festival you will know what I mean. OK, I've kept you in suspense long enough about a certain example of this. 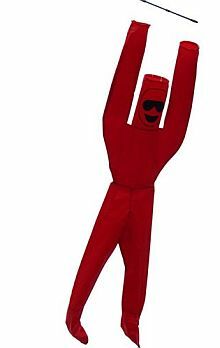 Sky Guys are inflatable human figures, with faces, that dance and float about while dangling from the flying line of a decent sized kite. Sometimes they are called Fly Guys. There's a red one in the photo. Not only that, but they can easily be linked together for an even more eye-catching display. Just one small example of the creativity going on in this area of modern kite flying! The phrase sky art is sometimes used for these creations, and it's entirely appropriate! There's too much variety to even attempt to mention each individual type of kite accessory for sale.